Happy New Year, everyone! Once again, the cards do not fail to amaze me. The figure in the 5 of cups is always sad, quite disappointed and heartbroken over the losses which were incurred in the recent past. However, it is all just water under the bridge, as the saying goes. Today marks a new day, a new month, and a new year. Allow yourself to shift your focus from the broken relationships and plans that failed, toward the positive aspects which still remain in your life. Careful nurturing and cultivation over these, in the next few months, will bring a new budding, and things shall begin to thrive. 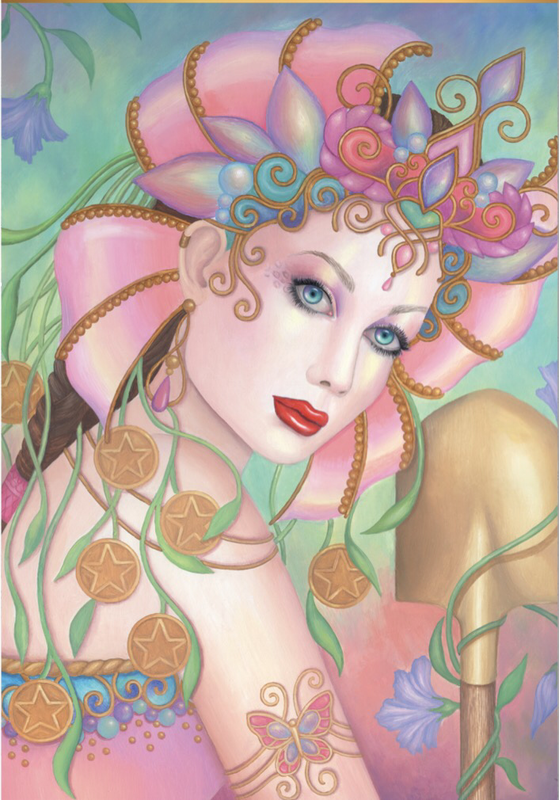 This entry was posted in Card of the Day, General Tarot, Readings, YouTube Videos and tagged 5 of Cups, Card of the Day, Guidance, Path, Reading, Tarot. Thanks in advance for your share! “Seven swords – five in the eye-patch, two in the earrings. A face stares out – one half is a beautiful pirate, with two Swords for earrings, the other side shows a death mask. Her bandana is tattered and torn on this side, there are five swords on the patch over her eye and her blonde hair is tangled and blackened. This is the dark face of betrayal and deception showing through the beauty. Her face looks sad – but sadness that she has been wronged, or that she has been found out? This card advises that trying to get away with deception never works – the truth will come out, the thief will be caught. Keeping secrets will come back to haunt you, the easy path will eventually create more work, even that you should ask for help rather than go along a path you can’t come back from. This entry was posted in Deck Review, Featured Card of the Day, General Tarot, Readings and tagged 7 of Swords, 78 Tarot, Artist, Guidance, Nautical, Path, Reading, Tarot. 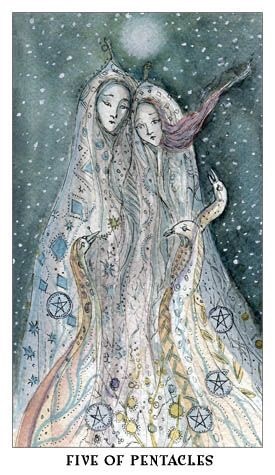 Today, we have a very beautiful version of this card, brought to us by artist, Paulina Cassidy. In the coming months, she is one of the artists whose work we shall be exploring and enjoying. Typically, to me the 5 of pentacles is reminiscent of Mary and Joseph finding no room at the inn. It is a card of hard times, material hardship, and lack. I find it very fitting that it has shown up on the very last day of 2016. Should you do a review of the past twelve months today, certainly you will find that you have ended this year on a better note than you did last December 31. 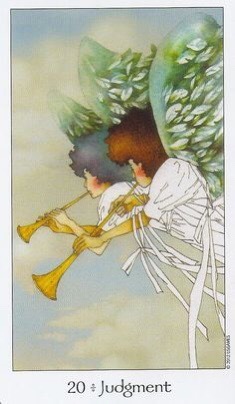 Honestly, this feels more like a reversed meaning of this card indicating that the end of this year is also bringing an end to the difficult times which you have been experiencing. Are they totally over? It depends on your level of optimism, and how far you have come, and how far you have left to go. But, if you were being honest with yourself today, I am certain that you will concur that, while your life may not be perfect, you have definitely arrived at a better space, which has put you in a position to proceed toward your hopes and dreams. This entry was posted in Card of the Day, General Tarot, Readings, YouTube Videos and tagged 5 of Pentacles, Card of the Day, Guidance, Path, Reading, Tarot. A dark-haired mermaid sits on a stone throne; an upright sword adorns her crown. A swordfish jumps out of the water to greet her, her only companion. The sky is clear, apart from a couple of wispy clouds, above which a bird soars, symbolizing her purity of intent, and her focus on matters of the mind over matters of the heart. She is distant, but not cold. A butterfly floats close to the mermaid, she reaches her hand towards it, offering her wisdom to it, and the swordfish with her. The Queen of Swords represents the need to experience emotions but not let them affect decisions or judgment. She roots out all the facts of a situation in order to best decide a course of action, and she is not easily fooled. This entry was posted in Deck Review, Featured Card of the Day, General Tarot, Readings and tagged Artist, Guidance, Nautical, Path, Queen of Swords, Reading, Tarot. Such perfect placement to see this card show up today! Truly, this is what tends to happen at the end of every year. Basically, your life, over the last twelve months, is up for review. It is not so much about judgment by the Universe, but your own judgment. This is a time for decision making, especially as to how to proceed in 2017. However, Mercury is still retrograde through January, so it may be necessary to reassess some of your decisions by the end of January. This entry was posted in Card of the Day, General Tarot, Readings and tagged Card of the Day, Guidance, Judgement, Path, Reading, Tarot. 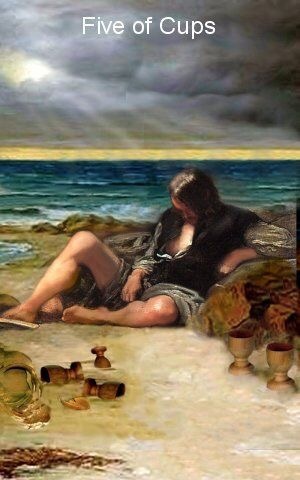 A maiden by the sea clutches four swords to her chest as she rests after a hard battle. She has come here for respite, and distance from her troubles. The sea behind her is calm, but grey clouds on the horizon show us that new trials will arise. Even at rest, she clasps one of the swords in her hand, a bloody sword that has already seen her through tough times and will do so again. But with time to regain a sense of self, she can face those challenges on her own terms. This card shows a temporary respite, before you have to get back to the task, or battle, at hand. A time to rest, to contemplate and recharge your mental and spiritual batteries before you get right back to it. This entry was posted in Deck Review, Featured Card of the Day, General Tarot, Readings and tagged 4 of Swords, 78 Tarot, Artist, Guidance, Nautical, Path, Reading, Tarot.